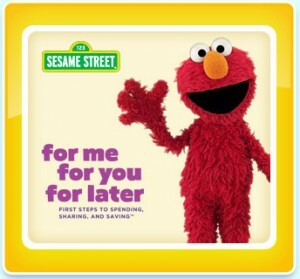 Get a free Sesame Street® “For Me, for You, for Later”™ kit. The free bilingual, multimedia kit includes a Parent and Caregiver Guide, a Children’s Activity Book, 3 Jar Labels, and an original Sesame Street® DVD that features Elmo, Cookie Monster, and their Sesame Street friends as Elmo learns the basics of spending, saving, and sharing. They are available at PNC branches or by calling 1-877-PNC-GROW (1-877-762-4769).